Cookies: Preheat oven to 350°F. Divide tube of sugar cookie dough in half. Mix one half with 1/2cteaspoon cotton candy oil and 5 drops pink food coloring gel. Mix the other half with the remaining cotton candy oil and 8 drops of blue food coloring gel. Scoop tablespoon-sized mounds of dough onto baking sheets, spacing them an inch apart. Bake cookies, one tray at a time, for 11-14 minutes. Allow cookies to cool completely. Toppings: Pour 4 ounces (1/3 of tub) of Betty Crocker™ Whipped Bright White Frosting into a small bowl and color with pink food coloring gel. Pour the remaining frosting into another bowl and color with blue food coloring gel. Spread pink frosting on pink cookies and blue frosting on blue cookies. Just before serving, top each cookie with a puff of pink or blue cotton candy to match the cookies. The cotton candy will begin to slowly melt once placed on top of the frosted cookies, so be sure to top the cookies no more than 20 minutes before serving. 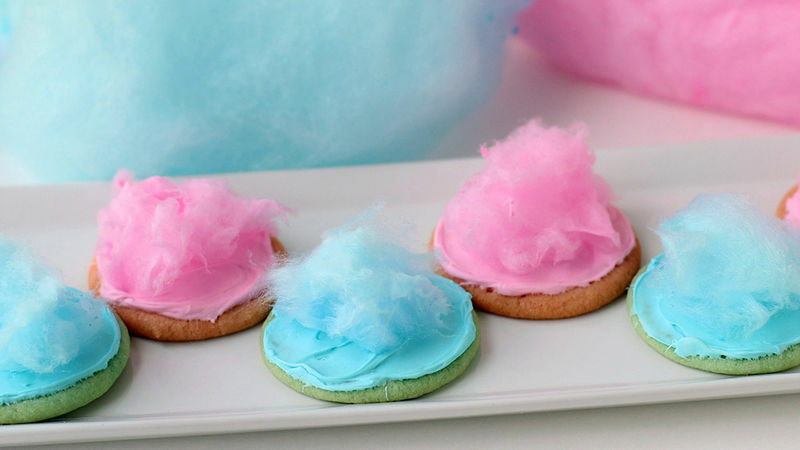 These cute pink and blue cookies are topped with real cotton candy! Bring the carnival to your next baby shower or birthday party by serving these Cotton Candy Cookies. They're super easy to make using Pillsbury™ Sugar Cookie Dough and taste like the popular carnival treat you've loved since childhood. Not only are they flavored like cotton candy, they’re also topped with some of the actual spun sugar goodness. The cotton candy puffs add a touch of whimsy to these colorful treats, which appeal to the kid in all of us! Start by grabbing your cookie dough, Betty Crocker™ food coloring, and cotton candy oil. Cut the tube of Pillsbury™ sugar cookie dough in half. Mix one half with 1/2 teaspoon cotton candy oil and 5 drops pink food coloring gel. Mix the other half with 1/2 teaspoon cotton candy oil and 8 drops of blue food coloring gel. Scoop tablespoon-sized mounds of dough and set them about an inch apart on parchment paper-lined baking pans. Then pop the pans in the oven for about 12 minutes. Allow the cookies to cool completely. Mix up some frosting. All you'll need is about 1/3 of a tub of Betty Crocker™ Whipped Fluffy White Frosting to make some pretty pink stuff. Be sure to make a bowl of blue frosting too. Then frost the cookies. Just before you serve the cookies, break of tufts of pink or blue cotton candy and set them on the cookies. The cotton candy will slowly begin to melt once it hits the moist frosting, so be sure to top the cookies just before serving for the best effect. Within an hour the spun sugar will turn to a pile of colored sugar, and that won't be nearly as much fun for your party guests. These cookies are so easy to make and so much fun, it's like bringing a piece of the carnival home. Enjoy!